INJECTION / ENGINE MANAGEMENT: The 690 Enduro R has always been amazingly economical with fuel and it runs even more efficiently in 2014. Why? Thanks to its low weight, its highly efficient engine management system with twin plug ignition and electronic injection with ride-by-wire. And also to its state-of-the-art OHC single-cylinder engine. 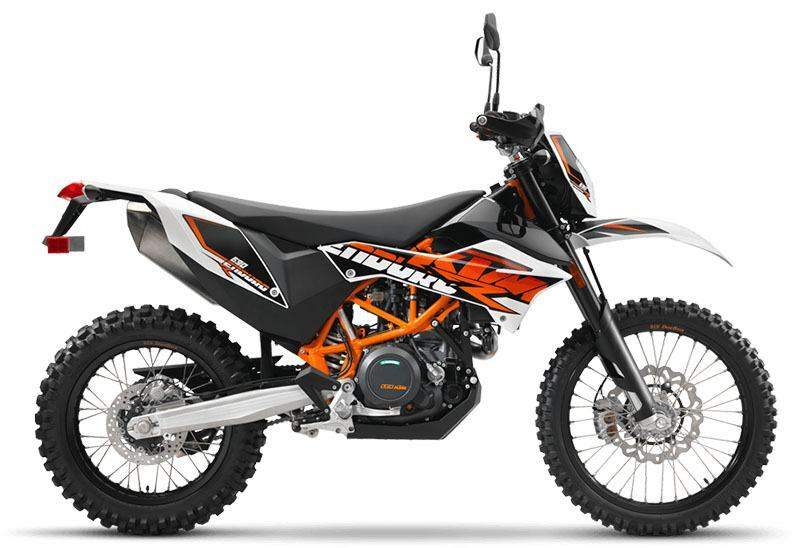 EQUIPMENT AND ERGONOMICS: Ergonomically optimized tank fairings are augmented by the comfortable seat and the ideally angled, wide aluminum handlebar to form a perfect arrangement that makes controlling the KTM 690 Enduro R extremely simple – both on the road and offroad. Its tyres, robustness and superb handling help provide the 690 Enduro R with remarkable versatility and perfect vehicle control both on the road and off. SUITABLE FOR NEW RIDERS: A restricted power version is available for those riders who just got license. Restricted power doesn´t necessarily mean restricted fun - thanks to its lightweight and dynamic chassis, KTM 690 Enduro R is the perfect buddy to push your limits. ENGINE: Modernised once again with twin plug ignition and ride-by-wire, the state-of-the-art, water-cooled LC4 single-cylinder on the 690 Enduro R delivers an impressive 49 kW (67 hp) from 690 cc of displacement. It combines powerful acceleration from the very lowest revs with an outstanding free-revving nature and refined engine running. It's extremely economical with fuel and saves its owner even more money, thanks to long service intervals of 10,000 km. Annoying rear wheel chatter? Prevented reliably by its slipper clutch that's fitted as standard.